Since almost the beginning of American style Democracy, the two party system has dominated the electoral process. Though the names have changed over time (i.e. Federalists, Whigs, Populists, Republicans, Democrats, etc. . .), their functions have remained much the same to support one another by theoretically opposing the other faction. The two parties, which usually to a varying degree resemble one another despite their claims of opposition, rely on the other to maintain their grasp on power. 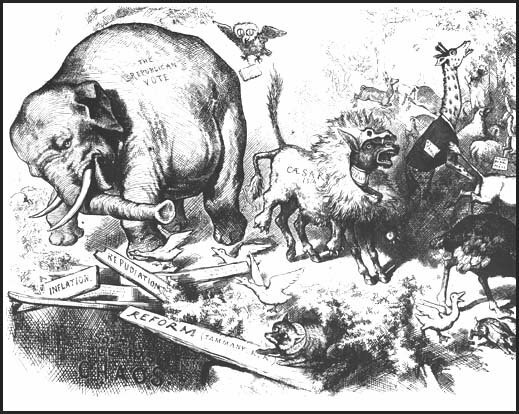 The current major political parties even trace the popular origin of their mascots to the same political cartoon by Thomas Nast in Harper’s Weekly, which was published on November 7, 1874. In addition they also share a history with the name Republican; as today’s Democratic Party traces it’s origin to Jefferson’s Republican Party. The emergence of two dominant factions is not uncommon within a so-called “First-Past-The-Post” election process, such as ours. A First-Past-The-Post (FPTP) process is any electoral system in which there is not a proportionate representation within the government. Maurice Duverger, a French Sociologist, first recognized this occurrence; and the law is consequently known as Duverger’s Law. Duverger stated in a series of papers, published in the 1950s and 1960s, that while this law is not absolute the simple plurality of the FPTP system would at the very least slow the emergence of a third party; and if a new faction does emerge it will be at the expense of an existing party. An example of this would be the election 1860 which saw the rise of the Republican Party, and the disbanding of the Whig Party. With the Electoral College forming the backbone of the American FPTP system the political influence that the two major parties enjoy seems to be theirs to lose. A study that was conducted suggested that 33% of American voters do not identify with either major political party, but instead identify themselves as independents. This inability to identify with the two factions could suggest a move towards the formation of a new party, but there has not been a third party that has seriously threatened the dominance of a major political faction in the United States since Abraham Lincoln’s election in 1860. In contemporary America part of the reason many Americans discredit Third Party candidates is because of modern communication systems. While the major national parties have the ability to raise money to appear on these outlets, the third parties lack the ability to develop the infrastructure of the established organizations. This exposure plays a big rule in who the American people vote for in the image driven culture we live in today, but third parties have a difficult time raising the funds needed to compete on a national level. The resulting lack of access denies voters information about all the possible candidates running for different offices. An example of this is the fact that during the 2004 Presidential election over 300 people ran for President, and with the exception of Ralph Nader, many of the candidates could not get television access across the country. The two parties, which are constantly raising money from special interest groups, enjoy this monopoly and use it to their advantage. This consequently gives the false impression that the major parties’ candidates are the only candidates. Each of the major parties know that when they do claim the title of majority it will only be a matter of time before they once again occupy the position of minority. So, the two parties feed on one another’s indiscretions in an effort to gain or maintain the majority within the Federal, State, and Local governments. It is this Despotic cycle that lulls both the politicians and voters into believing that these two parties, which are currently the Republicans and Democrats, are impervious to third party threats. This cycle of manipulation and exclusion often leads politicians to believe that they are above the law and this belief breeds corruption. Because of their lack of oversight or check by any third party, which American voters have been convinced by the media as well as the major political parties is a wasted vote, politicians have engaged in scandalous behavior almost from the beginning of the Republic. The majority party is almost always the faction that feels the most impact of a scandal, with the minority attacking it in an effort to gain voters’ confidence so that it has a chance of becoming the majority after the next election. Once they do come to power they feel absolute in that position till eventually the cycle repeats itself. One example of this would be the so-called “Corrupt Bargain of 1824”, during which the Jeffersonian Republicans split into four different parties; each party having their own candidate for President. With so many candidates there was no clear majority achieved within the Electoral College. Under the constitution when this happens the vote is passed to the House of Representatives for a vote. The Twelfth Amendment also states that only the three candidates with the most votes would be eligible to be candidates in the House; this excluded Henry Clay who only received 37 electoral votes. Andrew Jackson received the most electoral votes with 99 and won the popular vote with 151,271 or 43.3% of the total vote. Clay was, however, the Speaker of the House; and he detested Andrew Jackson, so he threw his support behind John Quincy Adams. Upon the first ballot Adams won and later appointed Clay his Secretary of State, virtually guaranteeing him the Presidency; because, up to that point every President from Jefferson on had held this office. This enraged Jackson who believed that the House would elect him, since he had won both the popular and electoral votes. For the next four years Jackson’s followers campaigned on the accusations that Adams and Clay had struck a “corrupt bargain” and in 1828 Jackson defeated Adams. This is of course not the only reason that one party gains the majority, but as history illustrates it is a far too common occurrence. and we must continue to hold the law in high esteem. It is the American people who must speak out once again against despotism, and end the cycle of party corruption. Only by enforcing the laws of this land and preventing future violations, can we secure the integrity of our nation.